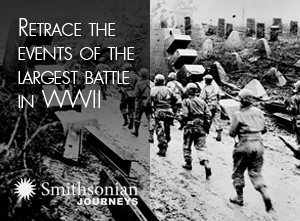 His note started the paper mill rolling, and eventually a letter of intent went to Douglas Aircraft. 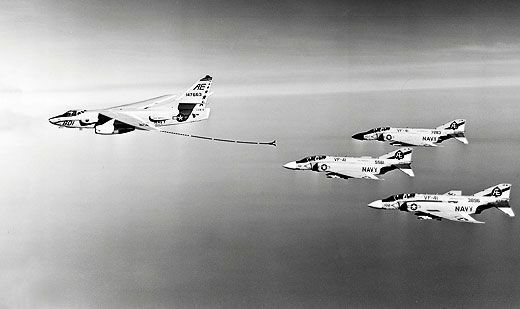 The legendary designer Ed Heinemann balked at loading up his Skywarrior with refueling equipment, but the Navy insisted. At the Douglas test facility at Edwards Air Force Base in California in 1956, flight test engineer Warner Lowe and I had just investigated the high-angle-of-attack engine stalls on A3Ds coming off carrier catapult shots. We were cooling our heels, wondering what fiasco would be tossed at us next, when we were told to go to Douglas in El Segundo, California. An A3D had just been configured into a tanker there, and Warner and I had to fly it to Edwards. For a couple of weeks, the test facility made various tweaks to it. The tanker had a four-inch-diameter hose with a refueling basket attached, wound on a large reel in the rear of the bomb bay. On the first test flight, we extended hose and basket to its full 60-foot length and listened for what the pilot of our Lockheed T-33 chase plane would say about its stability. Before he could open his mouth, the hose and basket whipped in a large circle and snapped off. Doing his best to sound like Chuck Yeager, Chase said, “Gents, y’all’s hose and basket are on their way down. Looks like a big ol’ snake flyin’ through the air. Better luck next time. See ya.” He did a slow roll and flew off. The Navy decided to try a “flying pipe” system of rigid tubing that hung beneath the A3D. 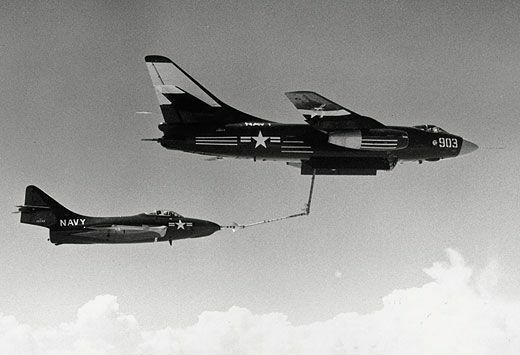 Though it proved somewhat stable, during one plug with a Grumman F9F, part of the tubing broke off from the Whale but didn’t disconnect from the Grumman. The F9F pilot was very unhappy about landing on the lakebed with several feet of tubing hanging off the nose, and didn’t want anything more to do with us. (Let him grumble. There was always another young test pilot eager to log plug time.) That was the end of the tubular refueling system. Various sizes of hose, drogue, and basket were then tried. We attempted hooking up with another A3D: That seemed to work after a fashion. The Navy wanted a pilot new to refueling to try our system. I was an old World War II fighter pilot (P-39, P-40, and P-51), and before the A3D flights had never even heard of a probe. So I was chosen. Although I had been the tanker pilot, I would now pilot another A3D and hook up with the A3D tanker. I had recently spent a week aboard the USS Forrestal and had ridden along on four A3D catapult shots and traps. Now I thought about the black of night with rain and more turbulence, and stopped grinning. All our connect tests had been fuel-less—and would stay dry until we were absolutely sure of the system. After dropping many hoses and baskets on the lakebed, accompanied by snide remarks from Chase, we figured we were about ready to get wet.